Historical novels are a great way to get transported to the past. I have not had much time for my own research about Old Shanghai recently, but I still can find time for reading books about it. 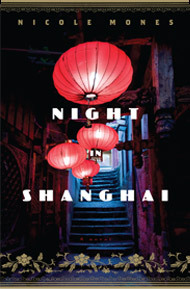 Having read a number of novels about Old Shanghai, like “The master of rain” or “Last seen in Shanghai”, “Night in Shanghai”was soon as on my list. The novel takes an original point of view from the start as the main character is black American jazz player Thomas Greene, who ends up playing in the Royal, one of the Shanghai dance club. Jazz was the music of Old Shanghai and the city had many jazz bands. The most famous were brought from the USA, recruited by agents and sent all the way to China to play in the large ball rooms such as the Canidrome in the French Concession or the Paramount in the International Settlement. The story of these jazz band players has often been overlooked, making the novel stand out by choosing this main character. Nicole Mones is a specialist on China and has clearly spent a lot of research on Old Shanghai. Historical facts are accurate and many secondary characters in the story were actual people. The book is the a great way to discover little known Russian composer “Aaron Avshalomov”, British envoy to help fixing China’s economy “Sir Frederick Leith-Ross” and many more. Old Shanghai nightlife is really well rendered, as well as the darkening atmosphere on the city coming with the Japanese invasion. Secondary characters, including crime lord Du Yuesheng are also coming to life in a very credible way. Unfortunately, historical facts and characters often seem to have been added as matter of teaching the reader with little connection to the actual story. The flow of the novel is regularly obstructed by side plots and details that were surely very enjoyable to research and write about but add little to the action. In a same fashion, food and music are described in great details, but lacking explanation, feeling or taste. Moreover, characters tend to explain to each other points that would have been obvious for them in the historical context, seemingly as an explanation to the reader, making them sometimes really weird. The central line of the novel, the love story between Thomas Greene and Song Yuhua seems over simplistic and not really believable. Characters regularly get an easy escape from trouble, and seem to be passing through dreadful events such as war and crimes without being really affected by them. Although I enjoy the historical research a lot, I have to admit that the story telling does not match it. Readers interested in Shanghai history will surely enjoy it, but other may be disappointed by the lack of depth and feeling of the novel. I am the author of “A Glimpse of the Chinese Language” available at http://www.rand.org pdf format free of charge for your reference. I taught Shanghainese i.e. Shanghai dialect at http://www.Dictyon.net, the gateway to global languages in Greenbelt, Maryland, USA. NINE OF THE WORKS IN THE FIELDS OF ECONOMICS AND CHINA STUDIES ARE LISTED IN THE LIBRARY OF CONGRESS ONLINE CATALOG. http://WWW.LOC.GOV FOR REFERENCE. Xi fang jing ji xue geng yao (An Outline of Western Economics) is listed in the Asian Division of the Library of Congress, Washington, D.C., USA.